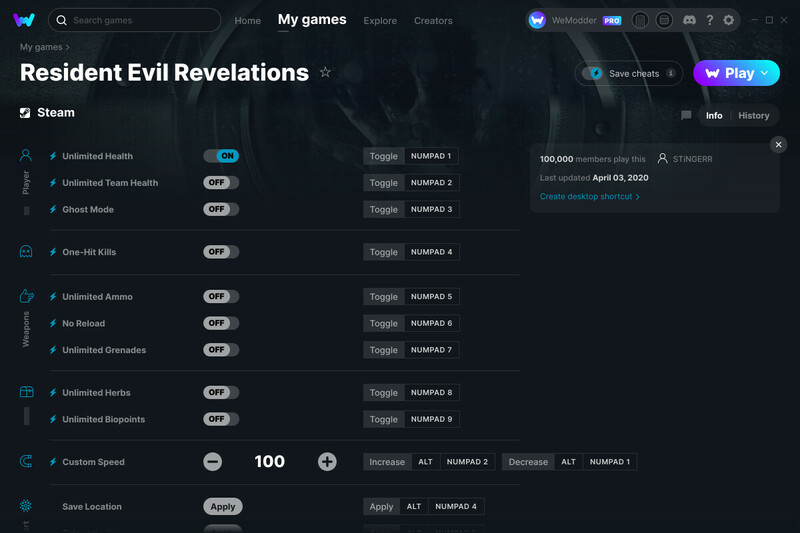 This is the official discussion topic of the Resident Evil Revelations / Biohazard Revelations Trainer and Cheats in the WeMod app. Please post any suggestions, bug reports, or praise that you may have for the cheats in here! Nice. Thanks stingerr finally a game for me i like !! My Infinity can find the trainer. It just keeps giving me the Infinity loading animation. Ive tried searching in the search bar, but the game doesn’t even show. Is it being worked on or it there an issue? Any ideas on how I can fix it? It’s like the trainer isn’t even on Infinity. But not sure why it not showing for you. Restart pc ? Thank you so much! Your suggestion worked. Again, thanks! And thank you STiNGERR for the trainer! Well i can tell you it works fine i have played this one and revelations 2 in the last week and both work with no problem. You have the game from steam ? No other mods on ? Hi Stinger, can you please include on the trainer or at least help on finding the code to change Raid Level? Because I really need to change my level to complete some RE.net challenges as my current level is 50 (don’t know why - maybe some CE xp code in the past) but in the https://www.residentevil.net shows as Level 32 yet. Trainers on here are for offline use only. Nothing here is for online use. Yo, it ain’t working for the cracked version. Ya. Probably not. Need steam version ! Glad you got cheat engine working, and just so you’re aware, none of our trainers are made for cracked games so they may or may not work. Yo moderator! For the RE Rev 2 , you guys know how to unlock Bloody Gina costume for raid? I’m sure many who played don’t wana’ use [Re.net] to acquire it.